Time for Wardrobe Wednesday. 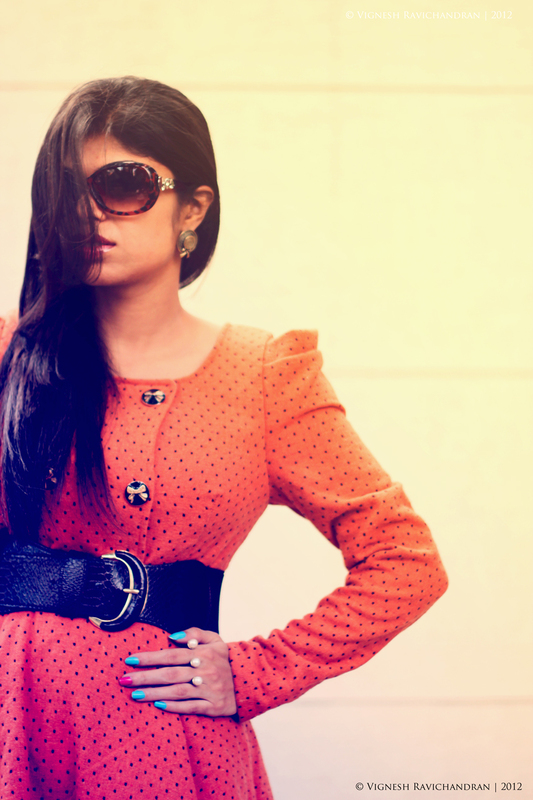 This week's inspiration is tangerine and polka dots. Well something I crazy about this summer - colored nails. I am crushing on the blue lagoon color bar nail paint. It adds the perfect contrast to my OASAP dress [BUY HERE!!] . I love this dress from OASAP.com [BUY HERE!!]. We can style it in so many different ways and the long princess sleeve gives it a very sophisticated and elegant touch. Now that summer's here. I thought I will make a post about must have fashion colors, trends, accessories , nail paints and sunglasses this season. 1. Mint green, Tangerie, Neutrals , Neons are the must have colors this season in your wardrobe. 2. Whimsical patterns from bird prints to deers, fruit, feathers. Polka dots are starting to make a comeback this season. Stripes - Stripes seem to hold a place in fashion year after year.High-Waisted flare pants are very much in this season. Of course florals are so big this spring and summer.Lace is a must have this season too. If you are not found of whimsical prints you can try paisley prints. Even shorts have made a big comeback this summer. 3. Footwear must have this season - Blooming tootsies, Gladiator Sandals, metallic infused footwear, lacey sky high heels, neon colored high heels and Cut-Out Booties (not something that be worn in India during summer because it's too hot). 6. As for nail paints any neon color would do the trick this summer. Try color blocking nails. How to style neons, lace and stripes please check my posts Color Mania, All over lace, Military and Lace and Ready Red. 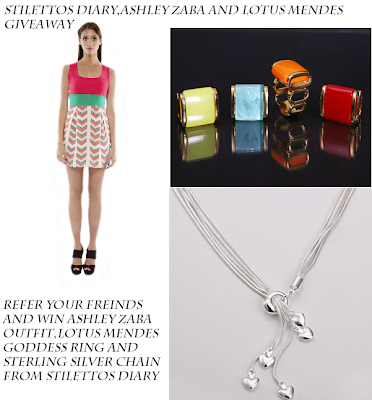 Don't forget to Join My birthday bash giveaway. Refer to win.Click on the image to participate. thanks a lot mathi :) I am in love with the dress too..
OMG Megha - You look like such a stunner! I absolutely love this look - It is so elegent! Check out my latest post to get free shipping from the Esty store, "The Nautical Wheeler"! Beautiful jewelry designs!! oh my gosh, you loook so beautiful! i love this dress! Simply amazing! Your work is getting better with every post! i found your blog through LB and just had to come and see more pictures of this dress! I love love love it. I have to say, it's definitely my favorite color this season. And I love that your nails are bright blue and they scream to be notice - the contrast is fantastic!! I love this outfit! The dress is amazing. Gorgeous post dear. Lovely dress, wonderful nailart, beautiful shoots..you are amazing!! gorgeous! love the hints of blue in your ring and nail color! I love the shape of these shoulders! so stunning and with those nails as a nice touch. wow that color/ jacket style looks amazing on you. fabulous outfit! That is one stunning dress and you look amazing in it! Indeed, so chic! thank u juneli :)<3 best part is you can wear it as a long coat as well and team it up with stockings. You look fabulous. The tangerine is just so yummy and so are those shoes. I love that you put a contrasting nail paint to avoid a monochrome outfit. Love it! Love that dress on you! And the details (rings, polish, etc.) are so beautiful! thanks a lot alexandra.. :) I love the nail polish. sky blue color looks divine! that's a really great dress! the color looks wonderful on you! Absolutely love the dress. Very pretty and the shoes. 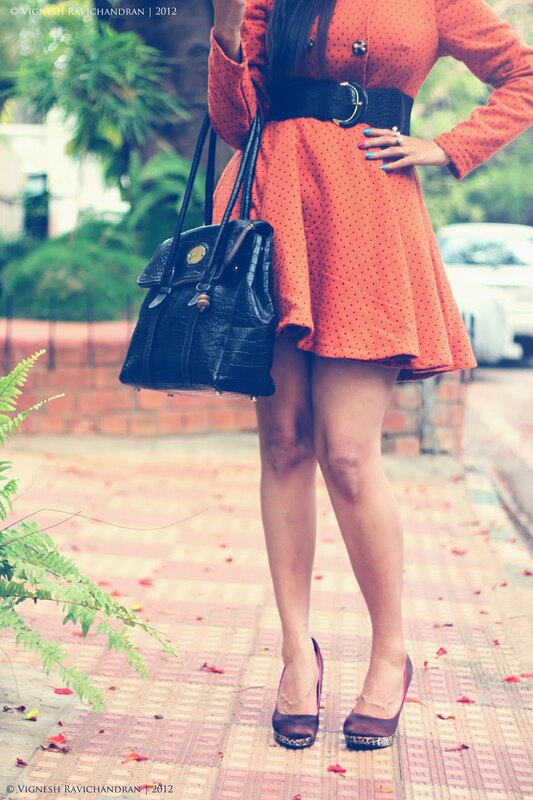 Tangerine and polka dots, two trends in one? omg u are extremely beautiful and your style is just so marvelous! I love it! Beautiful dress! Lovely! You look so pretty! Love this dress <3 Gorgeous & every elegant! You have impeccable style, love your dress. You look amazing. i love your outfit and your blog :) wanna follow each other?? You are just looking soo fabulous!! Love your nail polish! And your gorgeous shoes!! I recently stumbled across your blog and I LOVE it! I love the layout to the content and everything in between! 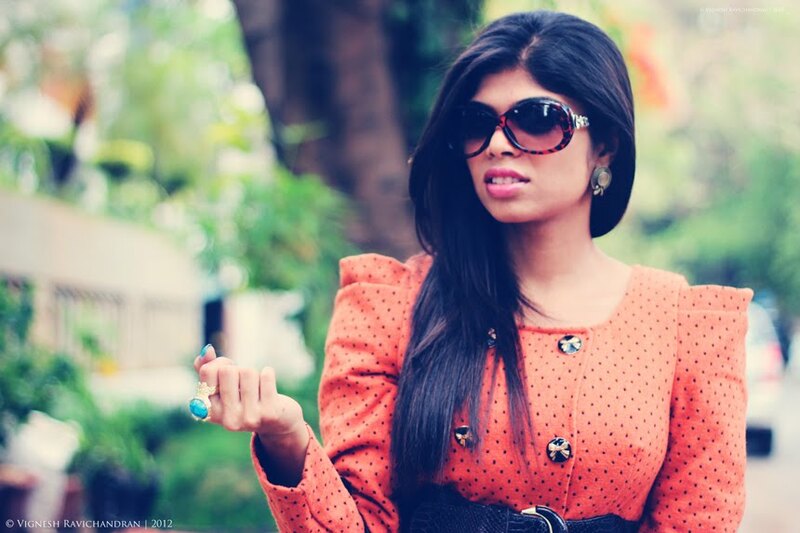 Your style is just impeccable and your blog is simply the epitome of perfection! 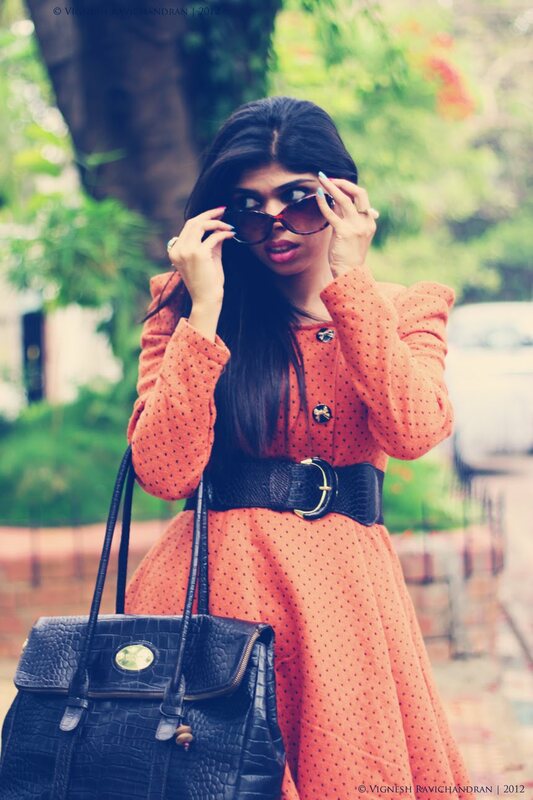 Love how you are a desi fashion blogger too! I am your newest, most avid follower, I look forward to reading your future posts. I would love it if you could perhaps follow me back too? You look so chic! 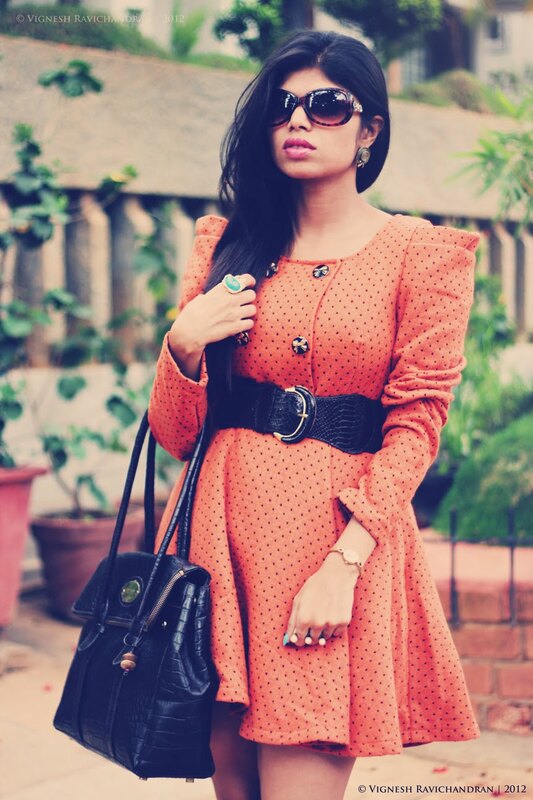 Tangerine suits you so well, girl! Incredible outfit! beautiful!! Love the dress, in Tangering Tango me too today! If you want we can follow each others on google connect and bloglovin! thanks so much for your comment dear! your ar beautiful like freida pinto!! love your blog! we can follow each other! i already follow you! Love that look!! so gorgeous! The color really looks great on you :) love the whole outfit - so Chic! I too love the colored mani, it adds a wow factor and a little surprise. The dress is really pretty! What a great outfit! really love the color of your dress and your nails! Oh so chic! You look fabulous! So chic indeed! Love your dress and shoes. hi there, when and where did you buy that hidesign bag? it's gorgeous! have never seen that design in the stores (delhi) before. would love to get my hand on one, any tips?? hey nagalakshmi.. I got the bag from pondIcherry. There pondicherry store is amazing. U can check shoppers stop I have seen this bag. Its called Munch- Brown bag. thank you for the super quick reply! is your bag brown? i thought it's black. i am in singapore and won't be able to head down to pondy any time soon for sure. not sure about shoppers stop either.. which city are you talking about? also, where did you see this online? sorry for too many ques :) if i find it, will order it rightaway. i saw the brown one in bagskart but i like what you are holding here, which looks like black. its the darkest shade of brown. There website is http://hidesign.com. Since you are from outside India if you are interested in buying you need to drop an email to support@hidesign.com. Just drop the link of this post and say you are interested in this bag. YES its the same bag in bagskart. http://www.bagskart.com/hidesign-munch-8903439225681-croco-brown-ladies-handbags.html Its darker color than the pic..But i got it for lesser price. The bagskart price is more by almost 1000 bucks. You can buy it from hidesign directly. thank you so much for the prompt reply. i wrote to them and they said they can deliver the bag to the nearest store to where i can pick up. thanks again! I like the dress, very ladylike!